Water leaks can be notoriously difficult to detect. 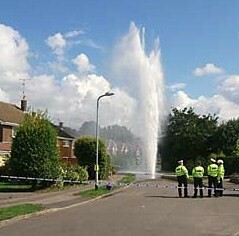 Even if a leaking water pipe is noticed, the cost and disruption associated with locating the source can be considerable. Too often walls and floors are unnecessarily damaged and even then there is no guarantee that the leak will be found. For a fraction of the cost incurred by using traditional destructive methods, our water leak detection service not only speeds up the identification of leaks but also reduces the inconvenience associated with the repair work. Once the leak has been located it will be possible for us to repair the leak or replace the piping as efficiently as possible if required. We also have the services of an experienced Plumber to hand. As part of our ongoing development we are offering inferred thermography, acoustics and endoscopy leak detection services for the non-destructive invasive testing of industrial, commercial and domestic premises. The combination of these technologies greatly reduces time spent, disruption and excavation while identifying faults within the building and therefore reducing costs. Mains supply leakage (Internal and external). Identification of moisture coming from an unknown source and origin.